Comments: Another incredibly rare old game by tiger. And it has an official Space Invaders license too! Considering the popularity of space invaders back then, I don't know why tiger made so few of them (today these are impossible to find). 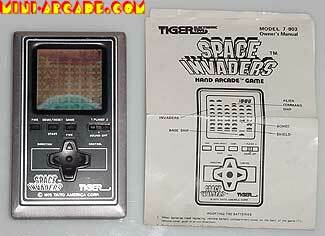 These old tiger games have cheap faulty screens, so maybe its because of that, or maybe a legal hangup with the license.